When I, Trader Bob, go to Philippe's in Los Angeles, the attraction (besides the French Dip Sandwiches) is always the pickled eggs. And ALWAYS, I look for the mustard to spread on the egg before every bite. 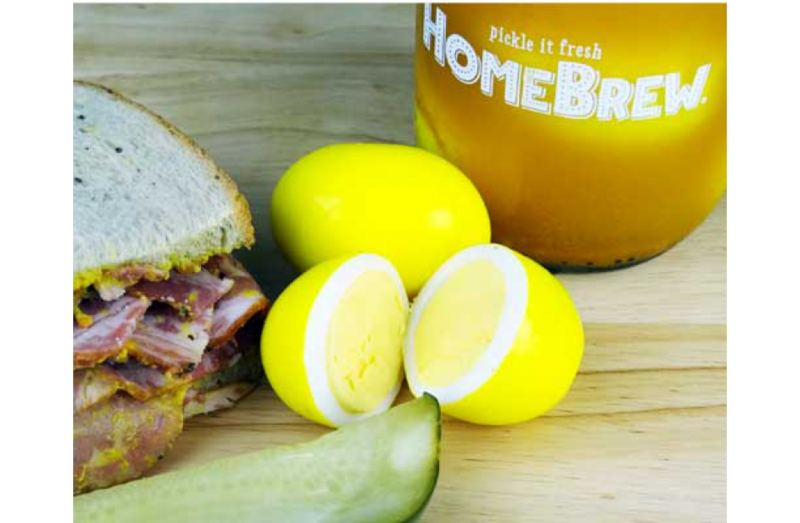 With Pickled Mustard Eggs, the hard work is already done. Dig them out of the jar, and enjoy. Aside from being beautiful and unique, hard-boiled eggs pickled in HomeBrew "Mustard Pickles" Quick Pickle Mix are the answer. I let mine "settle" in the fridge for a couple of days to enrich the bright yellow color. The resulting pickeled eggs are neon yellow, and the flavor is sublimely mustard, hard-boiled eggy, and delicious. Fun. Vibrant. Unique. Delicious.